In Frank Gorshin's last Bat-appearance till Season Three, the Riddler's making a movie. 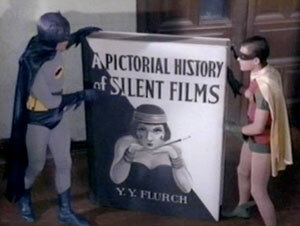 Silent-film-scholar Paul is digging this arc! But why does the Prince of Puzzlers bother filming Batman and Robin when he's got luscious, leggy Sherry Jackson on his team? More to ponder: This arc is based on a comics story in which the Joker, not the Riddler, impersonated Charlie Chaplin. Does this work as a Riddler story? Also: Francis X. Bushman reunites with a silent-era costar; why the "Aunt Harriet's birthday" scene might have some real utility beyond giving Madge Blake a reason to show up for work; who the heck is Y. Y. Flurtch? And more.